The Clay Cooper Theatre is hosting the Closing Ceremony Show for Veterans Week! 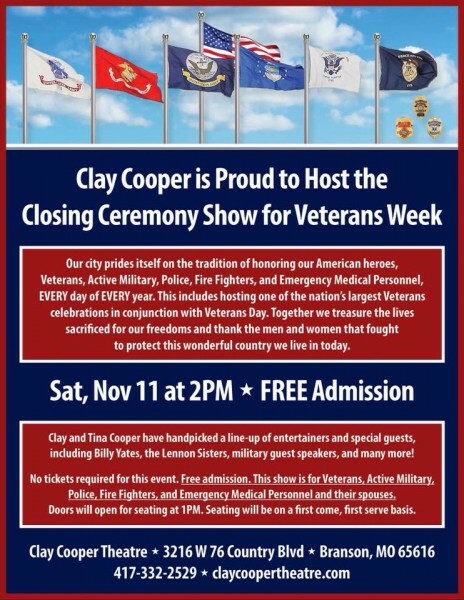 The Clay Cooper Theatre is hosting the Closing Ceremony Show for Veterans Week in Branson at 2pm on Sat, November 11th! Special line-up of entertainers and military guest speakers! No tickets required for this event. FREE admission. This show is for Veterans, Active Military, Police, Fire Fighters, and Emergency Medical Personnel and their spouses. Doors will open for seating at 1pm. Seating will be on a first come, first serve basis. Christmas Shows start November 1st in Branson! More on that next week.